Having a trusting relationship with a caring adult in the school setting can increase positive school outcomes including improved student mental health, increased attendance and improved grades/credits. From learning difficulties to a family crisis to depression – there are many different reasons why students struggle in school. When these struggles become overwhelming, a student’s health and safety become a concern, as does the likelihood of successfully finishing school. Fortunately, in Butler and Warren County, hundreds of high school students are moving closer to graduation and a more promising future every day. School Based Support Workers reduce and/or remove the barriers to academic achievement and increase students’ success and overall mental health. Support Workers are employees of LifeSpan who work on-site every day in local high school buildings to provide support to students, families and school staff. This service can be individually structured based on identified needs of the students, families, and school. Academic Assistance: helping students set and achieve goals to keep them on track for graduation. Prevention Services: engaging students to build skills allowing for personal and academic success using Sandy Hook Promise and Signs of Suicide. Intervention Services: individual one-on-one student support including collaboration with parents and school staff as appropriate. Mental Health Groups: peer support groups on topics such as anger management, conflict resolution, life skills. Information and Referral: making referrals to community agencies that provide food, housing, medical or dental care, and more. Crisis Intervention: support during times of crisis. 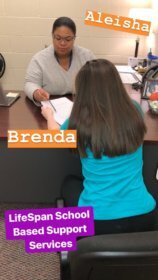 LifeSpan is the only agency in Southwest Ohio providing this level of service to students, parents, and schools. How is a School Based Support Worker different from a school counselor? School counselors generally focus on curriculum, academics and future educational planning. School Based Support Workers are more involved in things that may be going on at home (social and family problems) that are interfering with a student’s ability to be successful at school. They provide information and support and help students, parents and school staff work together to solve problems by communicating and providing referrals to other resources. What schools are the School Based Support Workers in? Aquila has been with LifeSpan since 2017. She graduated from The University of Cincinnati with a Bachelor’s Degree in Psychology and Loyola University Chicago in 2007 with a Master’s degree in Social Work She is a licensed social worker and is certified with the Ohio Department of Education as a school social worker. Aquila has a wealth of school and clinical experience, spending the past 10 years as a School Social Worker and Therapist in Illinois, Cincinnati and Connecticut. In her free time, Aquila enjoys spending time with her daughter and husband.